A community of educators takes a values-based approach to defining goals and assessing student learning. 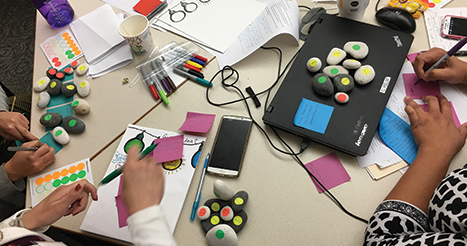 The Pittsburgh Maker Educator Learning Community connects educators from diverse educational settings interested in maker-based learning experiences. With guidance from researchers at Agency by Design (an initiative of Project Zero at the Harvard Graduate School of Education; Clapp et al., 2016), and with support from the Children’s Museum of Pittsburgh and the Quaker Valley School District, we sponsor professional development activities for 30 educators from 18 organizations throughout the Pittsburgh region. Our participants come from various content areas, they work at grade levels ranging from preK to high school, and they represent both traditional schools and informal educational spaces, including a library, museum, and after-school program. Initially, we came together to discuss and share effective ways to document student learning in maker-based experiences. But the more we talked about student assessment, the more complicated the topic became, leading us to wrestle with tricky questions about how best to define and measure the kinds of learning that matter to us. What would it look like, we wondered, to start from our own beliefs about what students need to know, rather than beginning with the narrow range of academic content and skills emphasized by state and district tests? Over time, we’ve developed what we call a values-based assessment strategy (Sachdeva, 2016), a collaborative process by which we identify those learning goals that we value most deeply and, in turn, identify promising ways to assess student progress toward meeting those goals. Author Steven Covey often talks about the relationship between the things we value and the ways in which we prioritize them. To illustrate, he asks us to imagine a jar representing our lives and a pile of rocks representing the things we value. The largest rocks stand for the things that matter most to us, and smaller rocks stand for things we see as less important. If we fill our jars with the small rocks first, we won’t have room left for the bigger ones. However, if we put in the large rocks first, we’ll then be able to fit many of the smaller ones into the empty spaces left between them. We adapted this idea to our learning community by asking our members to prioritize all of the elements that define their instructional practice. These elements ranged from skill and content acquisition to less-tangible concepts like curiosity and reasoning. Once they had listed all of the elements by importance, they labeled rocks with the skill, knowledge, or disposition that they most valued for their students, with the size of the rock indicating its importance, as shown in the photo. Through this activity, the teachers generated a long list of values. Some were learning goals typically associated with specific content areas, such as learning how to solve quadratic equations or knowing about the three branches of government. Others were “21st-century skills” such as persistence, creativity, collaboration, effective communication, and self-confidence. Still others included attitudes and dispositions such as curiosity and joy. So what values did teachers prioritize? While they came up with a lot of content-area learning goals, they tended to write those on the smallest rocks. By contrast, they reserved the big rocks for 21st-century skills and dispositions, such as creativity and self-confidence. Overwhelmingly, these were the ones they valued most highly. If we want to document and assess learning and engagement in our values, we need to create opportunities to make those values visible among our students. Every month, the learning community holds a daylong meeting at a different member’s school or organization. (Rotating these meetings maximizes our exposure to diverse learning contexts.) To begin, host teachers share their own approaches to documenting student learning and engagement, and they lead visitors on classroom walk-throughs, showing how they translate their learning goals into teaching practice. Walk-throughs are an organized classroom routine in which teachers and administrators visit and observe a series of classrooms to inform discussions about instructional improvement (e.g., Moss & Brookhart, 2015). While the specifics of this practice may vary from district to district, the general idea is that these observations can support reflective discussion concretely connected to classroom practice. The next phase is the observation. Before the meeting, the host handles the logistics of what rooms we can visit. The teachers are divided into groups of four or five and given a plan to visit two or three classrooms for 15-20 minutes each. During the observation, the teachers are encouraged to make notes about or even take photos of specific evidence of engagement in the kind of learning they most value. In the post-observation phase, the teachers discuss what evidence of engagement they observed with their group. This discussion is meant to encourage clarifying questions from each teacher and, through their various perspectives, provide a holistic picture of a classroom. It is not unusual for one teacher to discuss the lack of evidence of engagement in the learning they value even while another teacher notes a substantial body of evidence for the learning they hoped to see. For example, a group of teachers visited a science lab where each student was working individually. While one teacher documented little evidence of collaboration, another teacher documented extensive evidence of student problem solving. What would it look like to start from our own beliefs about what students need to know, rather than beginning with the narrow range of academic content and skills emphasized by state and district tests? Identifying our values is challenging. It’s not easy to identify values for classroom learning and engagement, and the process is ongoing. 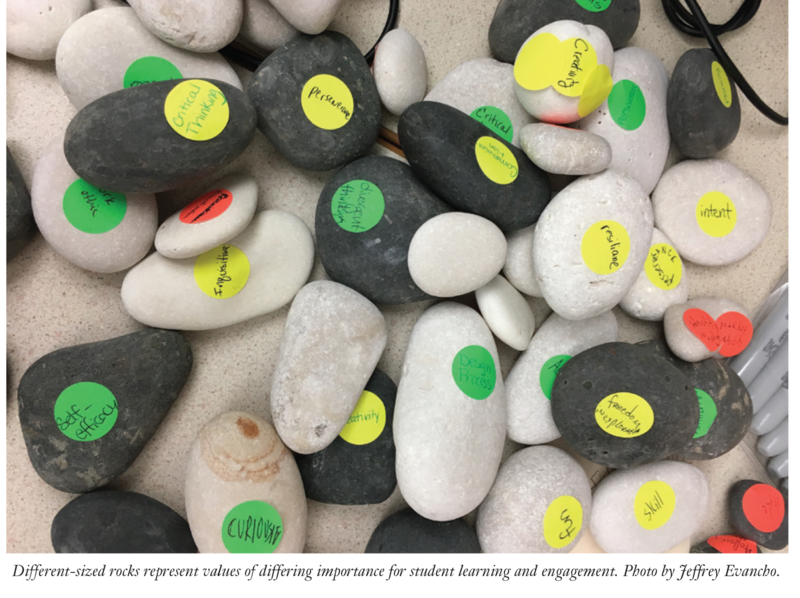 Although teachers identified their values through the rock activity at the beginning of the school year, they refined and sometimes changed those values over time. Focusing on what we value requires us to reflect continuously on our classroom priorities. Documentation is a crucial but challenging part of our instructional practice. And as with other parts of our practice, such as asking rich questions or facilitating discussions, we need to practice documentation to understand how to incorporate it into our teaching. Documentation provides us with opportunities for evidence-based reflection during our monthly community meetings. Our values are linked to our content. As we mentioned above, many of our teachers did not prioritize their content-area knowledge and skills as a primary value. However, over time we see the ways our values are tied to content. For example, persistence in math class is usually about persisting in the face of challenges solving math problems. Collaborating in an art class means working together around a particular art project. By acknowledging and refining our notions of what we value, we can use the content to create richer forms of evidence of student learning related to more high-priority values. And this, in turn, might enable us to weave content that reflects our values into our documentation and assessment. If we want to document and assess learning and engagement in our values, we need to create opportunities to make those values visible among our students. This means identifying what it looks like to engage in the learning goal that we value, designing our instruction to make the value visible, and then reflecting on whether what we saw really is that value. If we cannot see our value, then we have moved away from measuring it. Our learning community continues as we collectively hone our own values and share them within the community. As we continue the work of helping teachers reflect on their practice and on student learning in their classrooms, our new focus will be to hone our skills in designing instruction to elicit evidence of learning and engagement. This means moving beyond a focus on documenting, measuring, and interpreting evidence of learning and engagement to attend to the principles that might guide our design of these experiences. Each step gets us closer to having classrooms where the instruction and assessment reflect our most important values. Clapp, E.P., Ross, J., Ryan, J O., & Tishman, S. (2016). Maker-centered learning: Empowering young people to shape their worlds. San Francisco, CA: Jossey-Bass. Moss, C.M. & Brookhart, S.M. (2015). Formative classroom walkthroughs: How principals and teachers collaborate to raise student achievement. Alexandria, VA: ASCD. Citation: Wardrip, P., Evancho, J., & McNamara, A. (2018) Identifying what matters. Phi Delta Kappan 99 (6), 60-63. PETER WARDRIP (wardrip@wisc.edu) is assistant professor of STEAM Education at the University of Wisconsin-Madison. JEFFREY EVANCHO (evanchoj@qvsd.org) is Project Zero programming specialist at the Quaker Valley School District in Leetsville, Penn. ANNIE MCNAMARA (anne.mcnamara10@gmail.com) is a research fellow at the Children’s Museum of Pittsburgh, Penn.